CELSO Garcia topped the Datba Weekly Tournament held Saturday evening at the SM Lanang Premier Bowling Center. 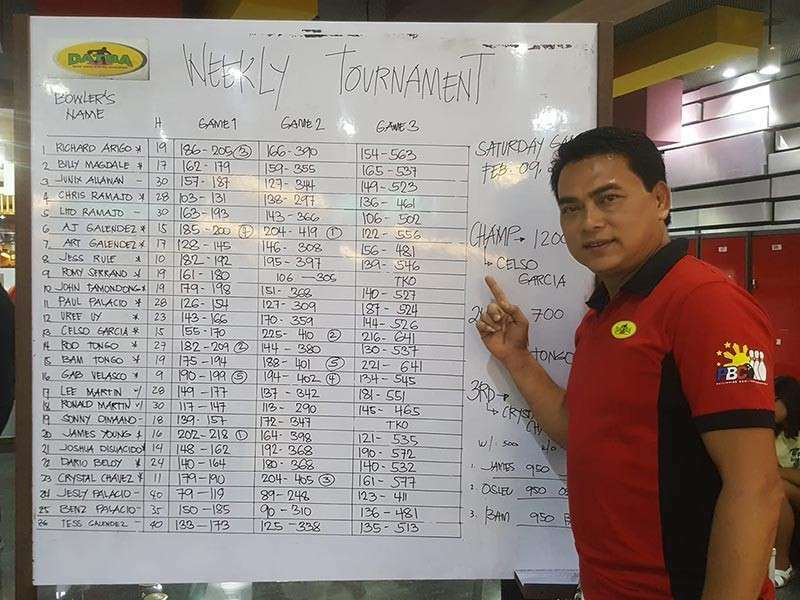 Garcia, whose handicap is 15, hit a total of 641 pinfalls after three games to rule the 26-player tournament organized by the Davao Tenpin Bowlers Association (Datba). He edged Bam Tongo who also scored 641 points but the latter placed second due to a higher handicap of 19. Female pintoppler Crystal Chavez, for her part, placed third by rolling 577 pins. Chavez had an 11 handicap. Meanwhile, Ivan Awid emerged Datba January 2019 Monthly Finals champion in a tournament held Febuary 3. Joseph Flores, Jr., Mav Manuel and Uree Uy grabbed the next three spots. AJ Galendez (720) was top qualifier while Rule (266) and Gab Velasco (214) romped away with the highest singles qualifying and highest singles finals titles, respectively.